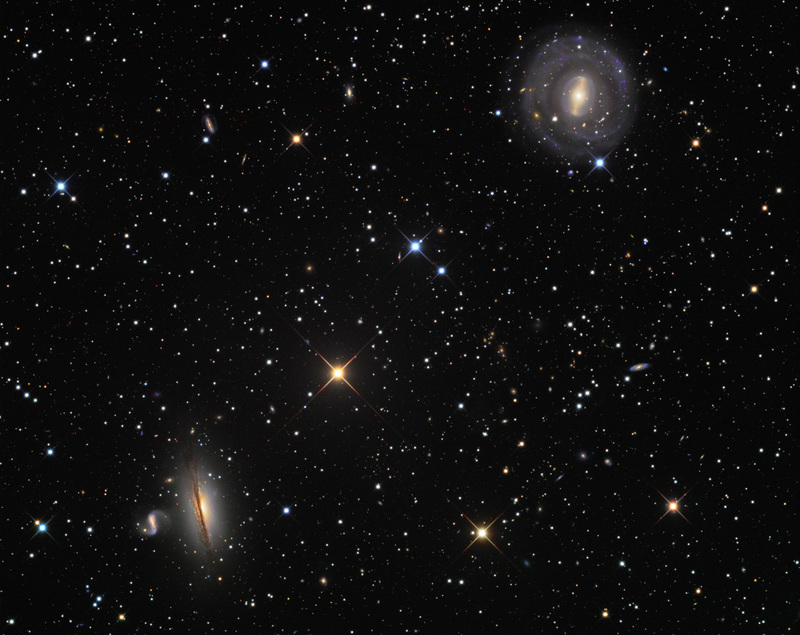 Explanation: This sharp telescopic field of view holds two bright galaxies. Barred spiral NGC 5101 (top right) and nearly edge-on system NGC 5078 are separated on the sky by about 0.5 degrees or about the apparent width of a full moon. Found within the boundaries of the serpentine constellation Hydra, both are estimated to be around 90 million light-years away and similar in size to our own large Milky Way galaxy. In fact, if they both lie at the same distance their projected separation would be only 800,000 light-years or so. That's easily less than half the distance between the Milky Way and the Andromeda Galaxy. NGC 5078 is interacting with a smaller companion galaxy, catalogued as IC 879, seen just left of the larger galaxy's bright core. Even more distant background galaxies are scattered around the colourful field. Some are even visible right through the face-on disk of NGC 5101. But the prominent spiky stars are in the foreground, well within our own Milky Way.